Sitejet is already built to make your workflow in creating new websites fast and easy. By using shortcuts you can increase your speed even more! Many shortcuts like copy, paste, delete, duplicate, undo and redo are already second nature to most designers out there. But there are also shortcuts tailored for working in Sitejet that makes building websites convenient and precise. Rearrange contents, create referenced elements and add new elements in milliseconds or access any important tool panel in an instant. 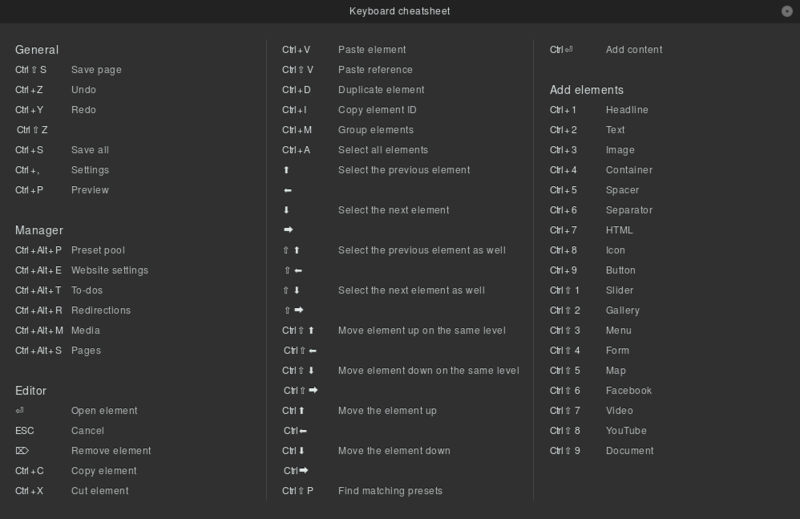 You can also access the cheat sheet in your CMS under General and Keyboard Cheatsheet or by pressing [Ctrl + K].